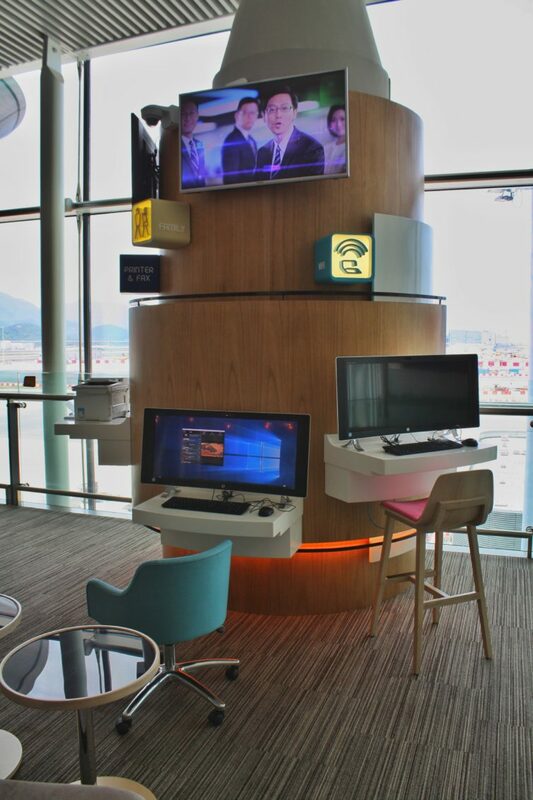 If you had to pick any place to kill some time, Hong Kong International Airport ain’t a bad choice. It’s a beautiful piece of architecture, it offers great runway views, and it has a lounge scene that’s arguably second to none. 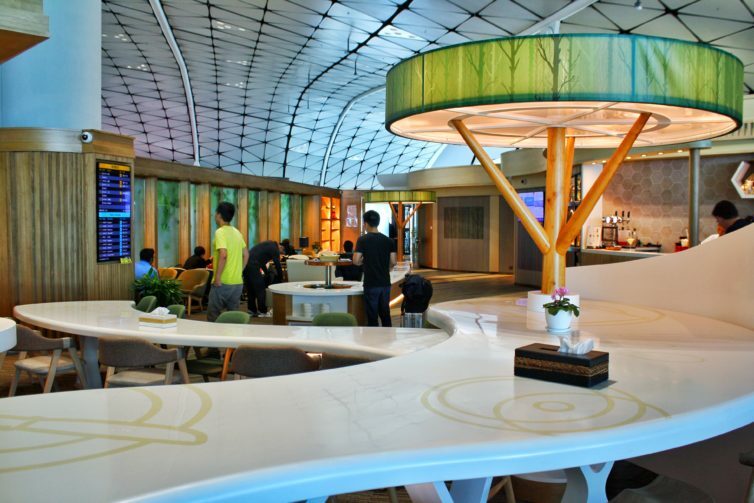 Most of its best known lounges belong to hometown juggernaut Cathay Pacific, which sets a pretty high bar for excellence in the ground experience at HKG. 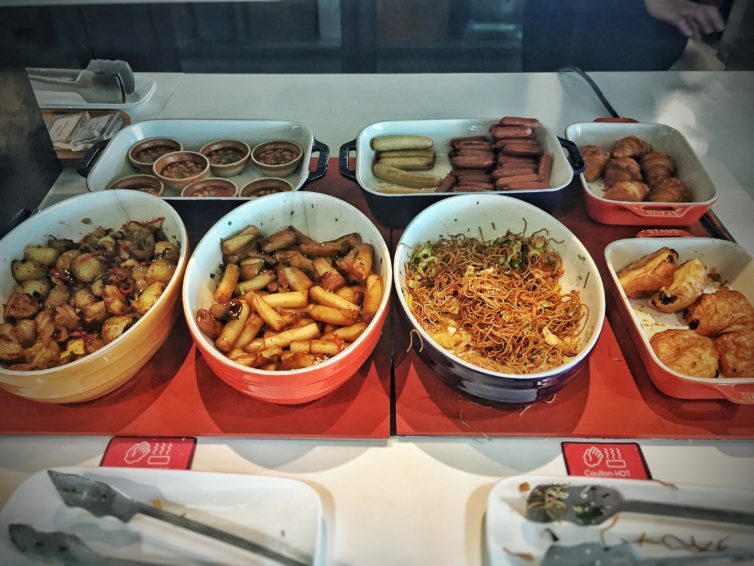 Enter player two: Hong Kong Airlines. Their inflight product was a joy to fly on their A350s — you can read that review here. 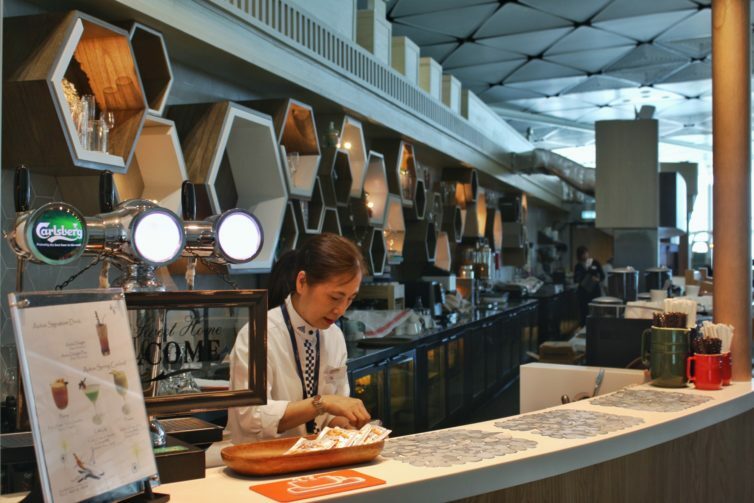 During our brief time on the ground in Hong Kong, we made sure to drop by the airline’s brand-new “Club Autus” Lounge at the HKG midfield concourse, where most of the airline’s long-haul flights depart. 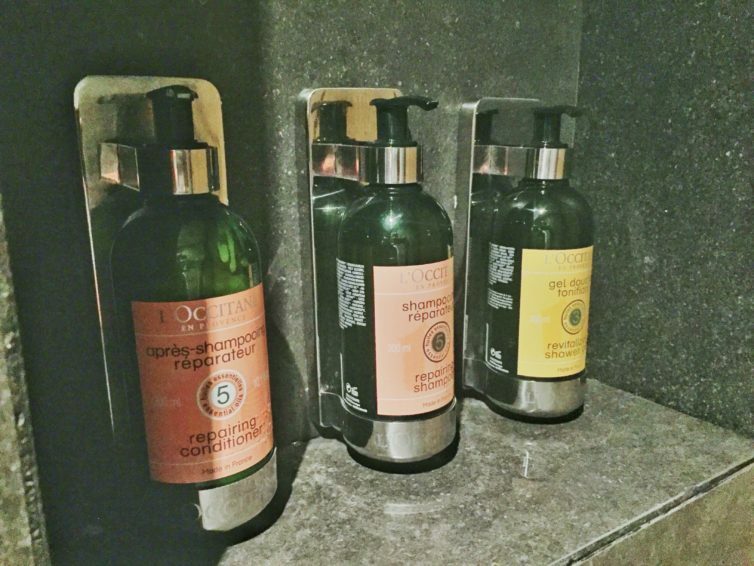 The lounge delivers all the necessities plus some bonus creature comforts, and does it with style — if sometimes a very quirky style. But after a few hours getting watered and fed, taking a shower, and enjoying some stellar runway views, we’d give Club Autus two enthusiastic thumbs up. 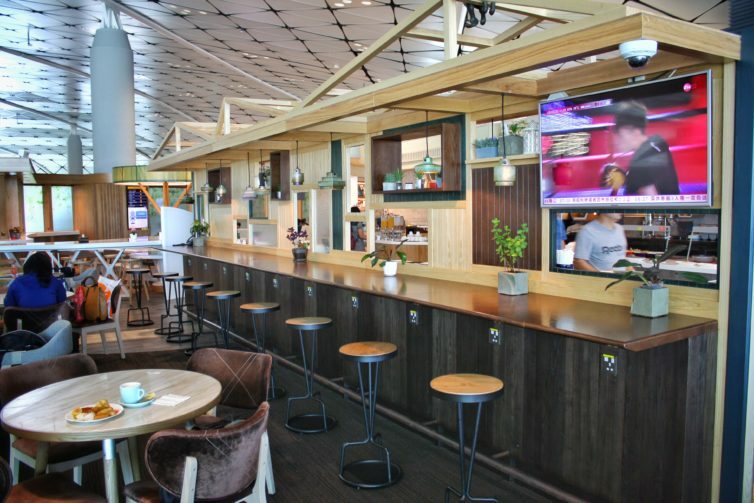 Read on for more photos and details about the new player on HKG’s lounge circuit. 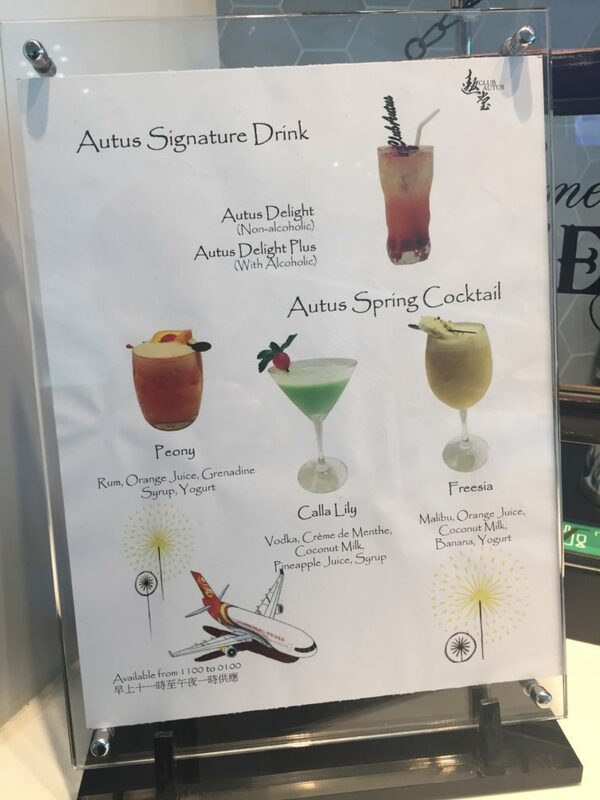 Club Autus is available to Hong Kong Airlines business class passengers, Fortune Wings program premium status holders, and can also be purchased for HKD 350 (~$45 USD) by anyone else flying the airline. 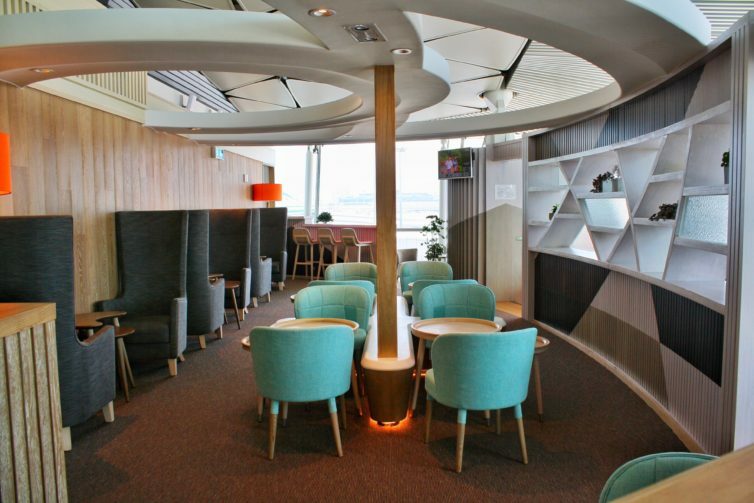 A few other airlines, including Virgin Australia, Philippines Airlines, Finnair, and Fiji Airways, grant their premium cabin passengers access to the lounge. 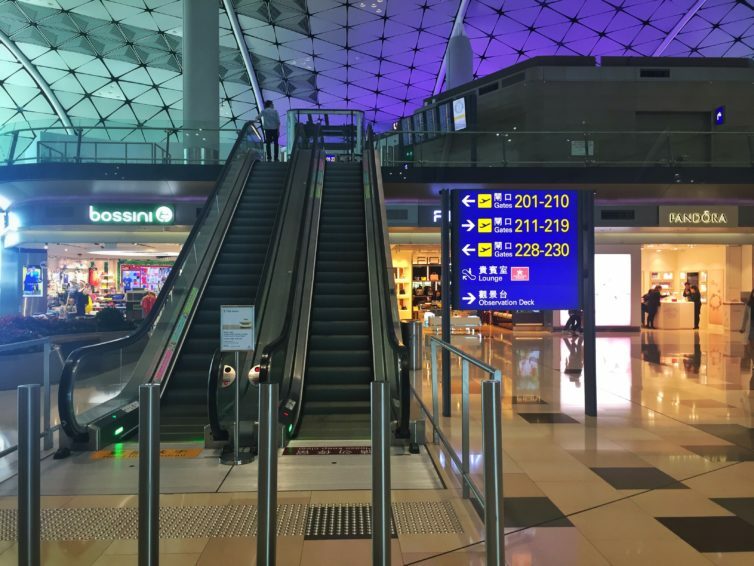 At the center of Hong Kong International Airport’s midfield concourse, a sign points flyers upstairs to Club Autus’ entrance. The lounge opened late last year. 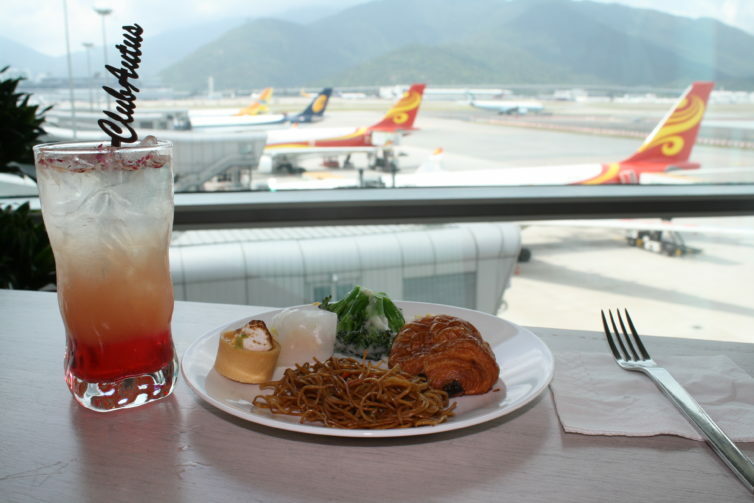 Previously, Hong Kong Airlines’ only lounge at the airport was Club Bauhinia, located in the main concourse. That space is still open, and is now probably less crowded than it used to be thanks to Club Autus’ opening. Bear in mind that if you buy a voucher, you’re not allowed to hop between lounges, so you’ll have to pick one. 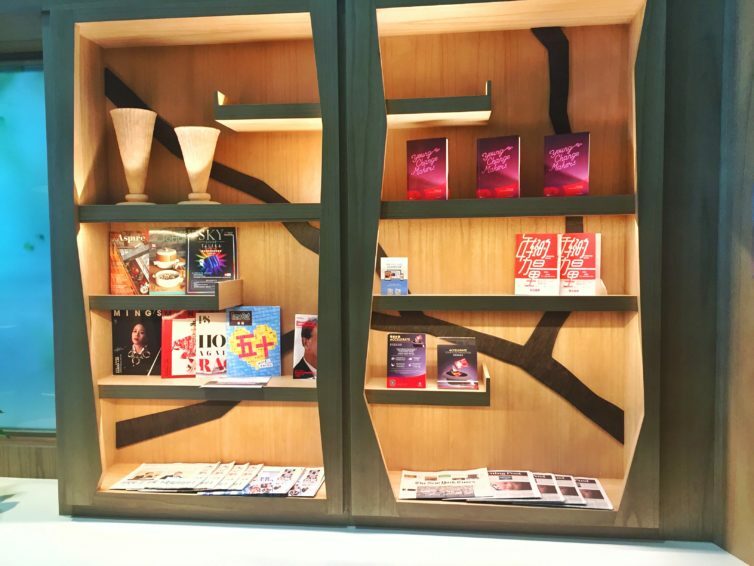 Just past the entry desk, a shelf welcomed travelers with reading material. I had a hard time figuring out how to describe Club Autus’ style, which featured lots of wood and earthy tones with a few real plants. Forest-contemporary, maybe? There’s a variety of seating near the entrance, including a set of broad curved tabletops. 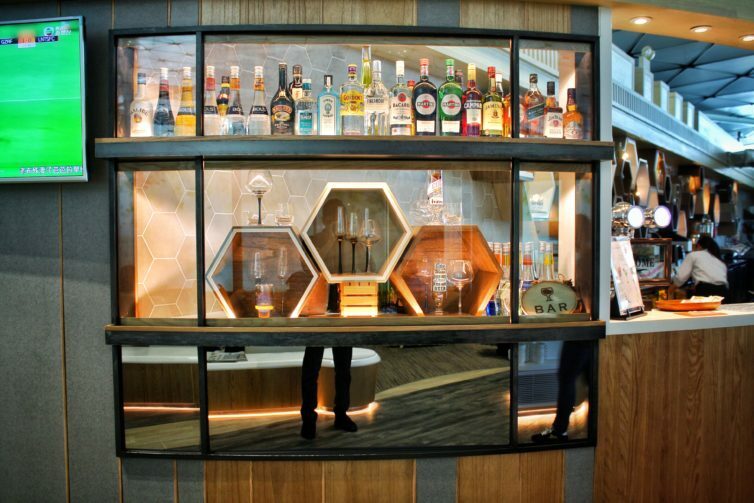 Running the length of the center section of the lounge is the bar and dining area — a really nice looking space decked out with honeycomb shelves. 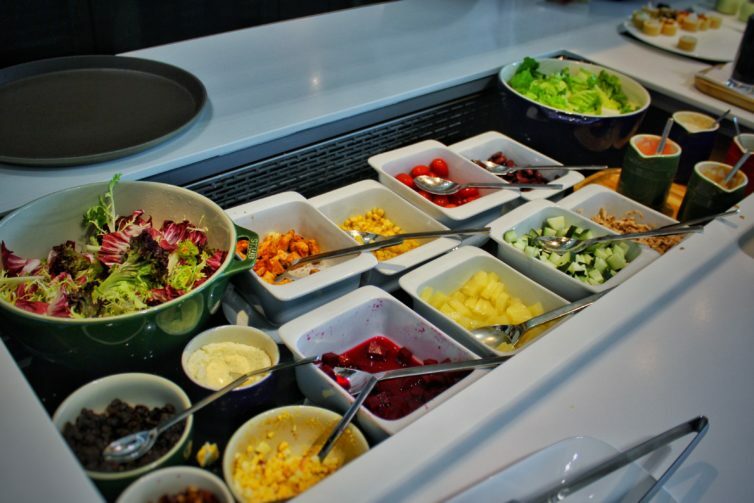 The bar is staffed and features a signature cocktail that contains a layer of rose syrup. 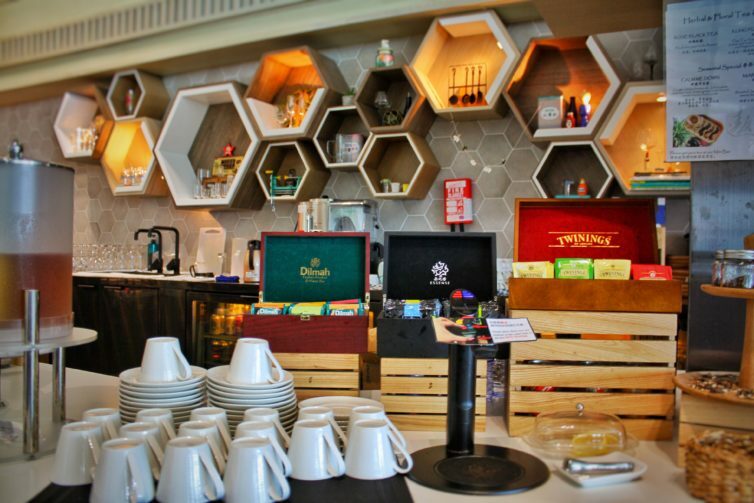 If you’re not in the mood for something boozy, there’s a huge selection of teas further down the bar, along with coffee and juices. 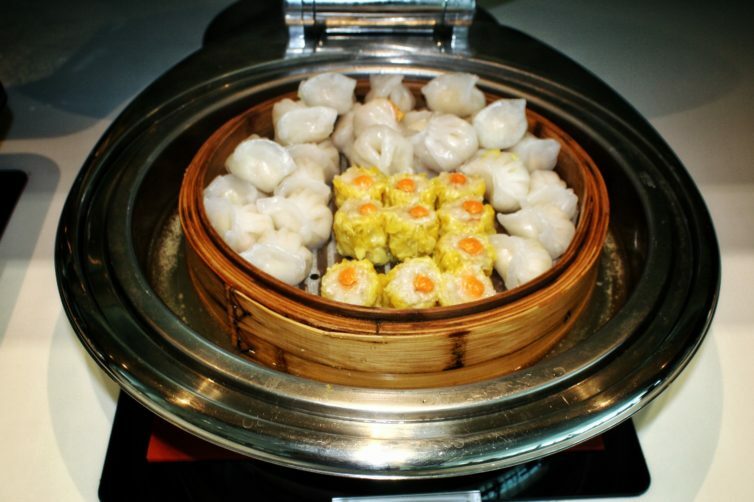 Food is one of this place’s strong suits. 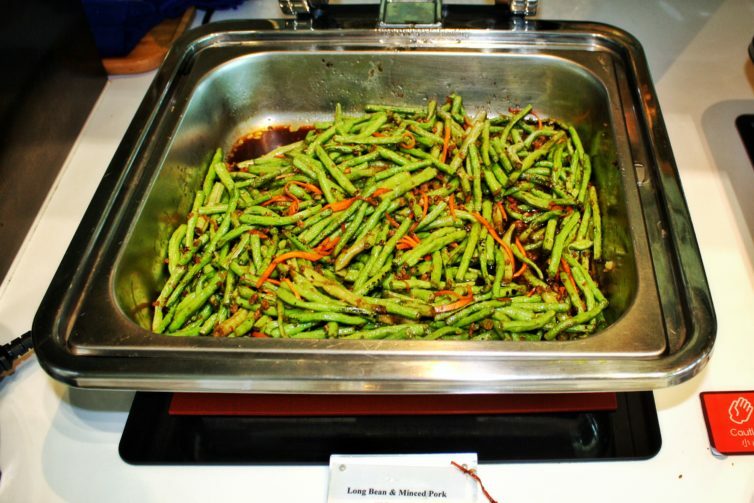 The highlight is a made-to-order noodle bar. 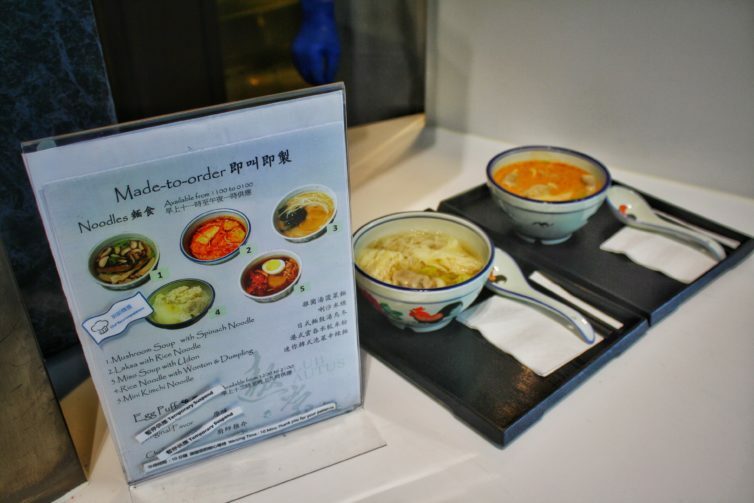 You place your order at the counter and take a seat somewhere in the lounge, and someone will bring your noodles right to you. 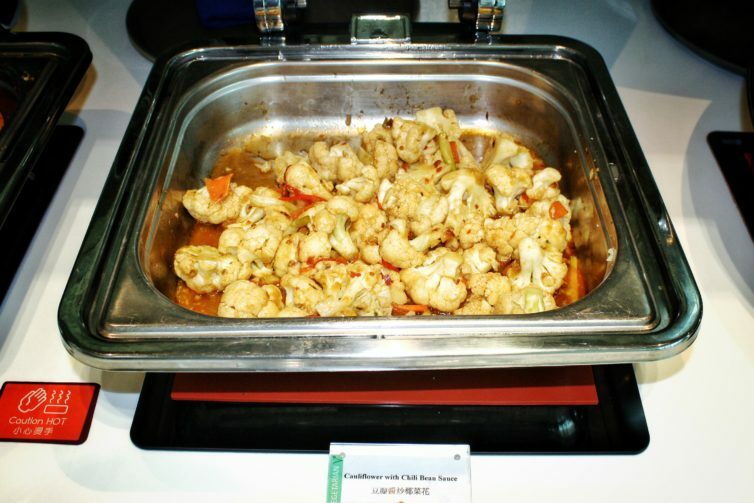 Then there’s a significant spread of self-serve salads, snacks, shu mai, and some heavier fare. 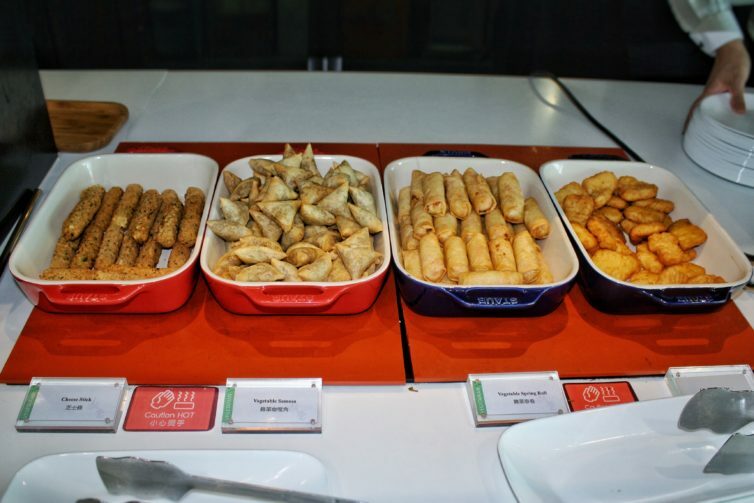 I was saving my appetite for the flight, so I skipped the noodles and grabbed a small sampling of the snacky stuff. Then I scoped out a place to sit. The full time I was there, the lounge was never so crowded that it was hard to find a place to sit, though the seating closest to the entrance did get a bit more use. I can’t speak to crowd factors in the early morning or later in the day, though. Past the dining area, there was some couch-style seating that wrapped around a small computer station, which also had a printer. 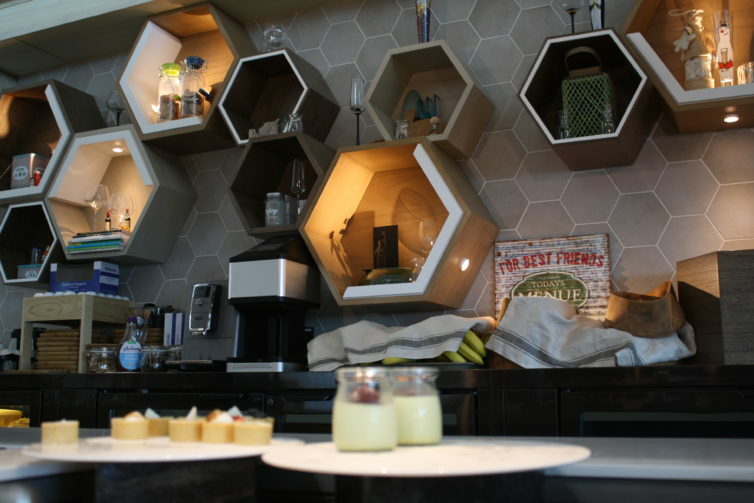 Next was a small nook with high-back chairs surrounded by some snazzy shelves. Although the terminal roof is cavernous, the ring-like ceiling fixtures in this portion of the lounge gave it a more cloistered, comfy feel. 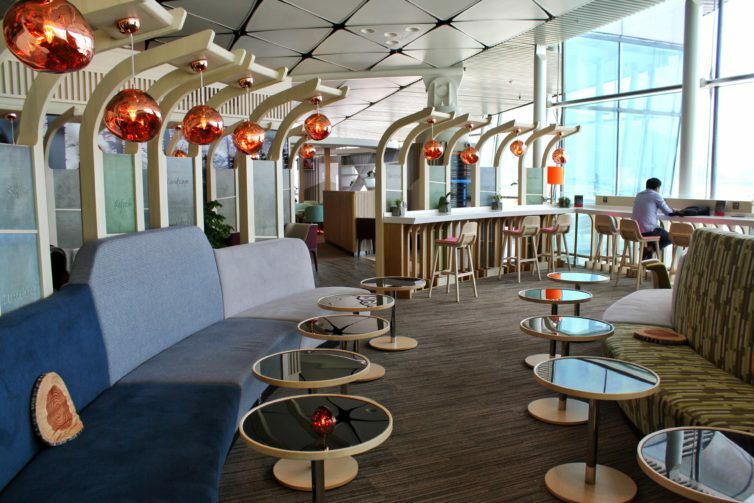 The rearmost part of the lounge offers the best view of the ramp. So obviously that’s where I chose to hunker down. 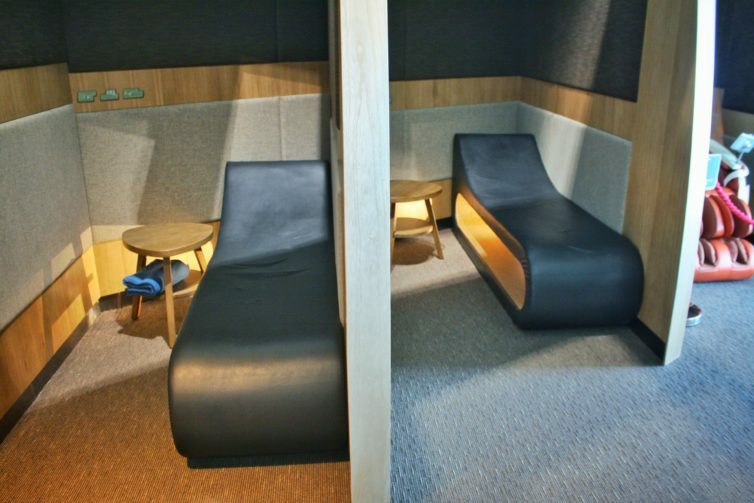 There’s a dimly lit nook towards the back of the lounge with a few nap stations, along with a massage chair. FYI, the lounge has a hidden Premium Section that’s only available to invited VIPs. I didn’t have access to it, so it’s not a part of this review. If any of you make it in, we’d love to hear how it is! 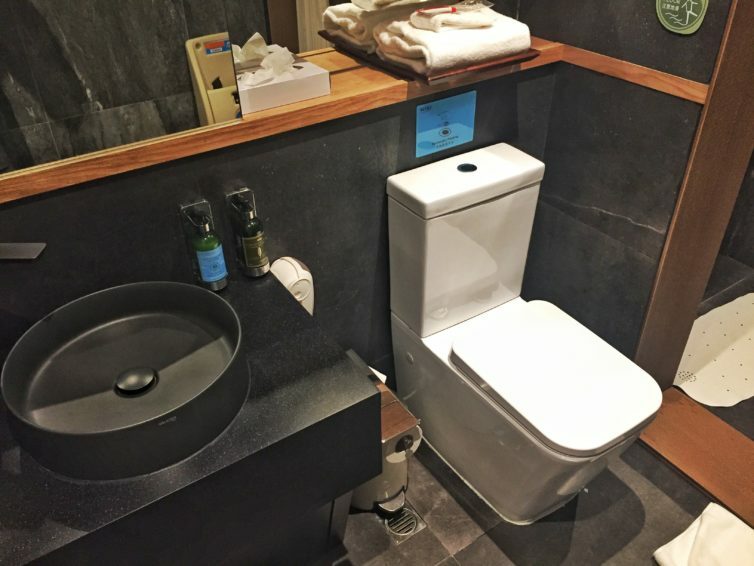 The lounge does offer all travelers shower facilities. 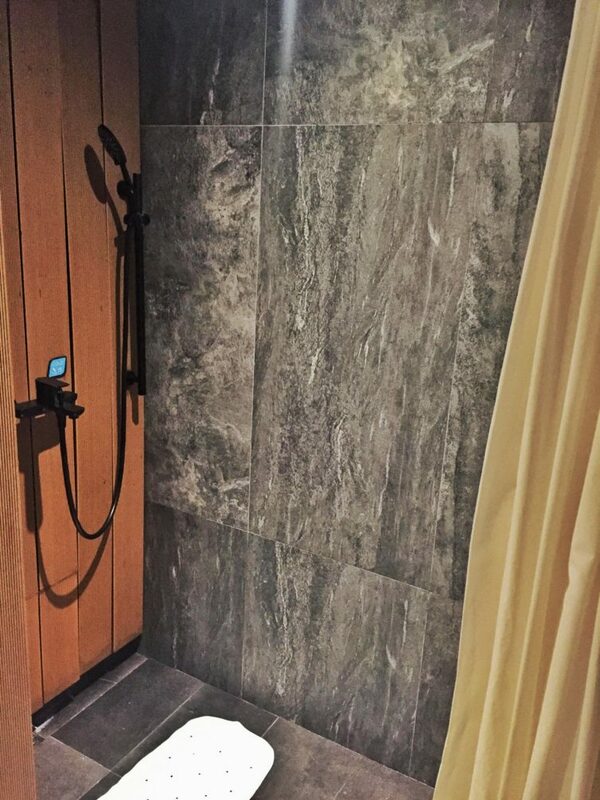 The shower room was large, looked great, was spotlessly clean, and had the full range of amenities. It was definitely one of the best in-airport shower experiences I’ve had. Feeling nice and refreshed, I headed for my gate. 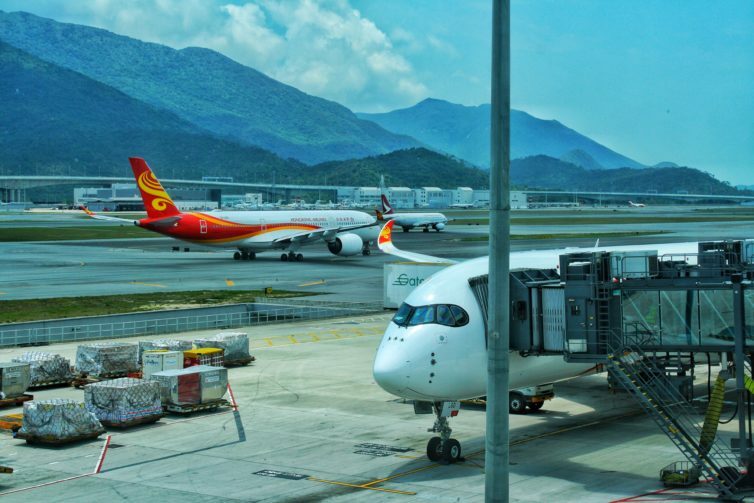 Hong Kong Airlines offers a strong inflight product on its new A350s, but does it have the ground experience to match? After dropping by the new Club Autus, I’d say it absolutely does. 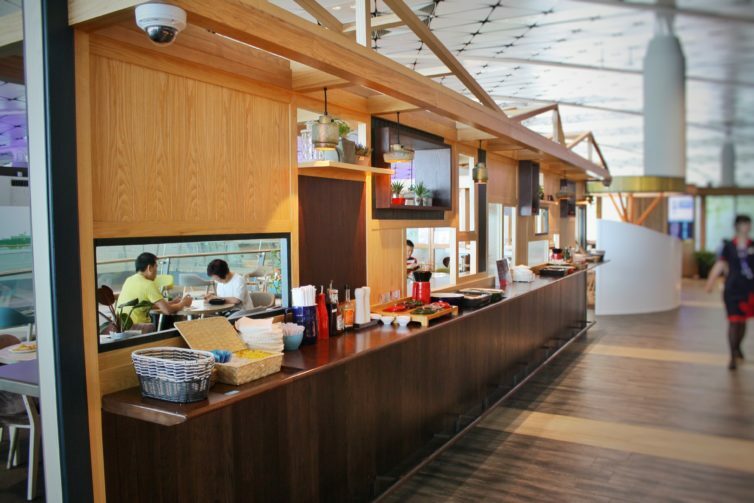 The main ingredients for a competitive flagship lounge — made-to-order food, sleep spaces, showers, and views — are all present and accounted for. Clearly a lot of attention went into Club Autus’ style and design, and the result is a genuinely great looking space. 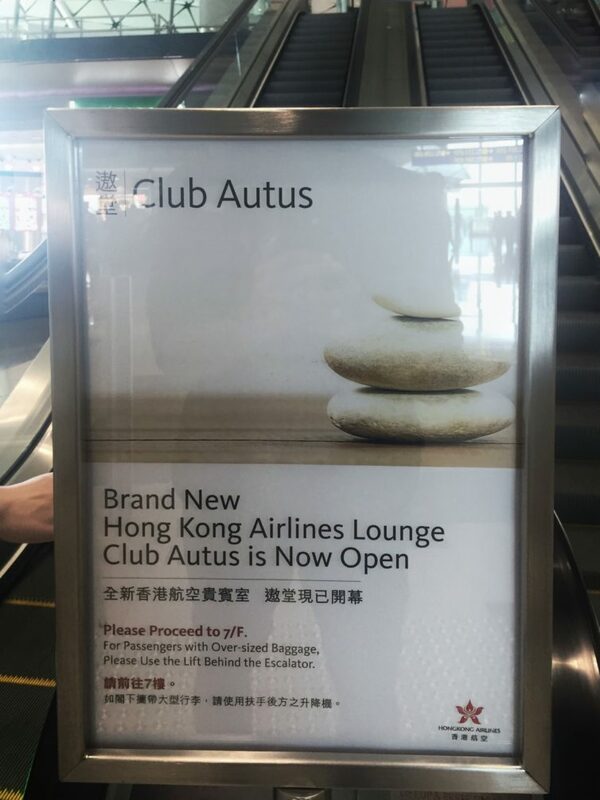 It’s a bit hard to know exactly what brand image Hong Kong Airlines is trying to cultivate, but based on Club Autus, it feels like they’re going for amenities on par with their local full service competitors (namely Cathay) but with a less formal, more playful style. I wouldn’t list Club Autus in my personal list of my top five favorite lounges, but I’d give it a strong 4.5 stars out of 5. 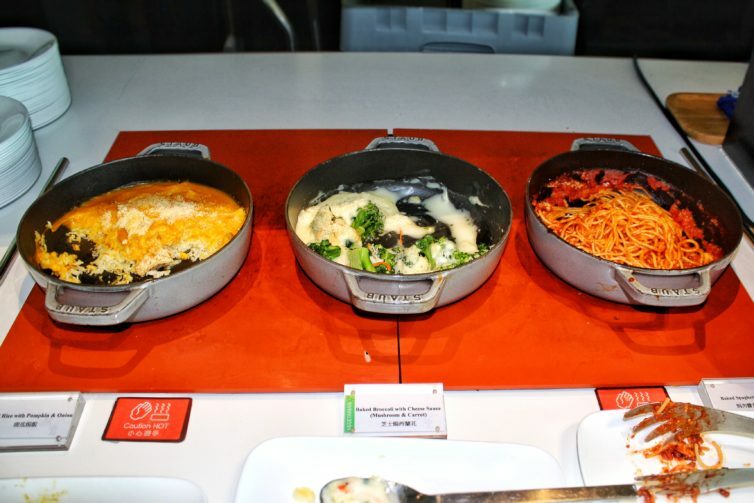 It’s definitely worth dropping by if you have access, and if you don’t have access but you have a layover longer than two hours, you may find a HKD 350 (~$45 USD) voucher worth it — especially if you’re in need of a meal and shower. Now it’s time for us to hear from you. 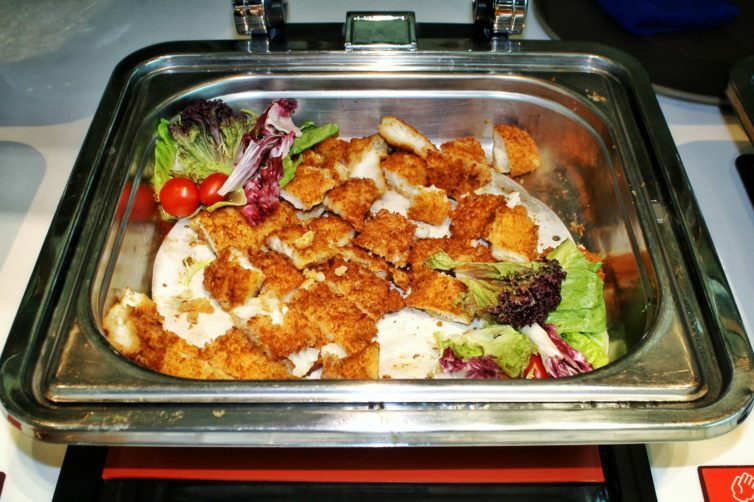 What’s your take on Club Autus? Share your thoughts in the comments section below. 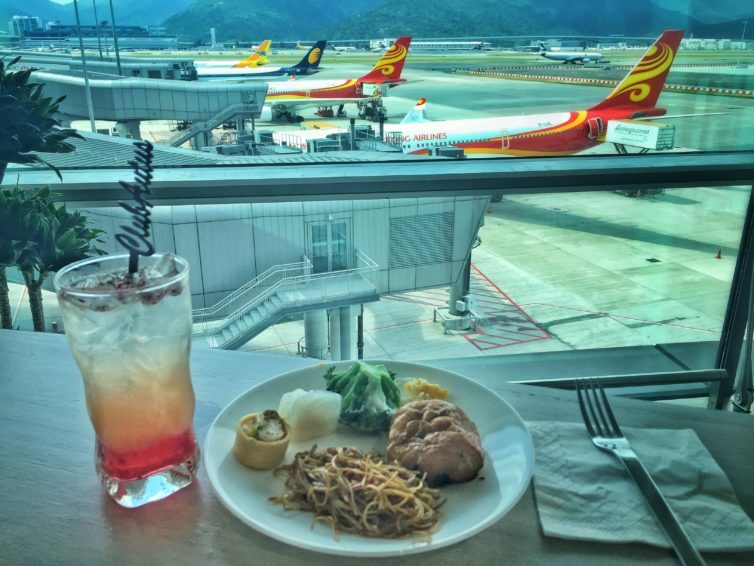 The post Photo Review: Hong Kong Airlines’ Club Autus Lounge appeared first on AirlineReporter.